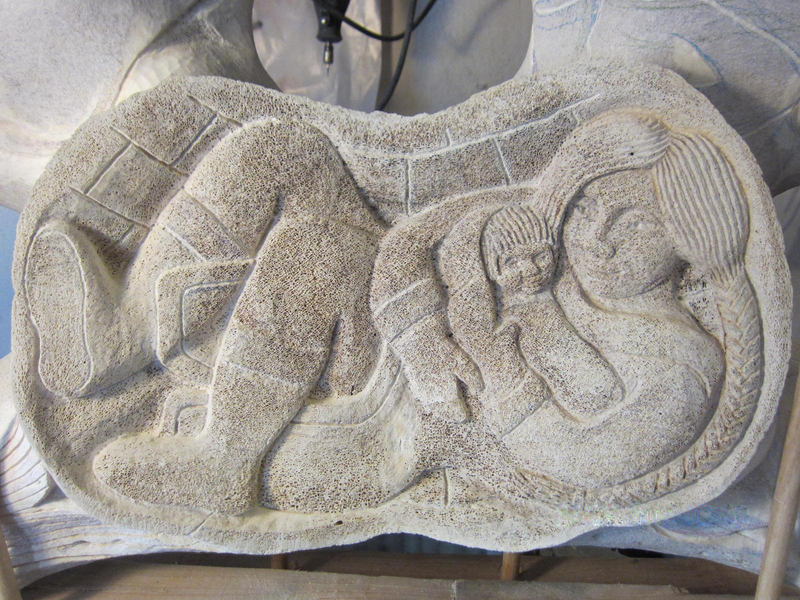 Sculptor, Matt Caines, is offering a unique opportunity to learn stone carving at his workshop in Abergavenny. Matt has been exhibiting his work at The Art Shop for a number of years, and having recently moved to the area with his family, has set up a purpose built studio to offer evening and weekend classes. He has not long returned from six weeks in Arctic Canada on a Wingate Scholarship to learn traditional Inuit stone carving techniques. Matt studied Architectural Ornament at City & Guilds School of Art, London, following a first degree in Fine Art. Recent work includes designing and carving a plaque in beech, unveiled by H.R.H The Prince of Wales; workshops at the Museum of London based on Roman artifacts and at the Sir John Soane Museum; and the restoration of Sam Wanamaker’s stone at the Globe Theatre. Scholarships include the Queen Elizabeth, Winston Churchill & Wingate.